Martha Moxley's sole sibling, her older brother, John Moxley, was asked to take a polygraph by the Greenwich Police Department. It was an inconvenience he greatly resented, for understandable reasons. More than just an awkward formality, however, the polygraph was issued as a direct result of questions surrounding John's actions, both on the night of October 30, 1975, and immediately subsequent to his sister's untimely passing. In the eyes of a few people, John Moxley exhibited some suspicious behavior. Normal, however, is a word without much portent when it comes to assessing the reaction of an individual to losing a loved one in such a horrible, tragic, and nearly inconceivable manner. John Moxley, only seventeen at the time, was dealing with an incredible loss: On the edge of his own property, his fifteen year old sister was horribly murdered. Debilitating feelings of futility and guilt must have certainly plagued him to one degree or another. It is understandable, given these circumstances, that John might exhibit some curious behavior. Nonetheless, it is still necessary to examine the behaviors and inconsistencies which made John Moxley a suspect -- albeit a minor one --in his younger sister's murder. 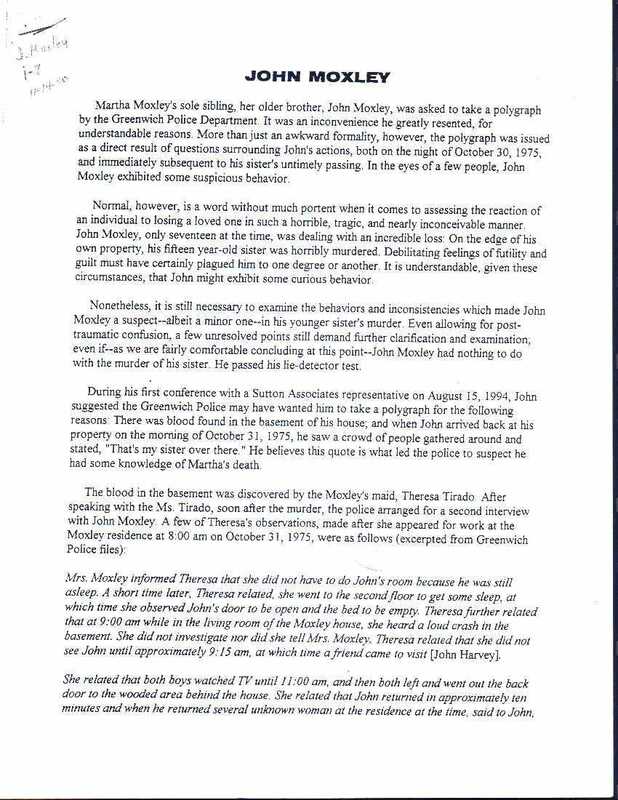 Even allowing for post-traumatic confusion, a few unresolved points still demand further clarification and examination; even if -- as we are fairly comfortable concluding at this point --John Moxley had nothing to do with the murder of his sister. He passed his lie-detector test. During his first conference with a Sutton Associates representative on August 15, 1994, John suggested the Greenwich Police may have wanted him to take a polygraph for the following reasons: There was blood found in the basement of his house; and when John arrived back at his property on the morning of October 31, 1975, he saw a crowd of people gathered around and stated, "That's my sister over there." He believes this quote is what led the police to suspect he had some knowledge of Martha's death. Mrs. Moxley informed Theresa that she did not have to do John's room because he was still asleep. A short time later, Theresa related, she went to the second floor to get some sleep, at which time she observed John's door to be open and the bed to be empty. Theresa further related that at 9:00 am while in the living room of the Moxley house, she heard a loud crash in the basement. She did not investigate nor did she tell Mrs. Moxley. Theresa related that she did not see John until approximately 9:15 am, at which time a friend came to visit [John Harvey].